What is Remote Access Software and How Important it is in Today's Education? Whether we're for it or not, there's no denying that technology has become a vital part of modern education. The technological advancements we've seen in the past couple of years have all contributed to the increased efficiency of how learning is facilitated inside a traditional classroom setting. The invention of computers, tablets, and smartphones have made life for students and teachers a lot easier. These tools allow them to create lesson plans, present reports, and facilitate classroom discussions. Aside from the functionalities stated above, there's still a lot of things modern technology can provide to education. If we really wish to get the most out of our computers, tablets, and smartphones, then we should start investing in remote access software. If you're asking yourself now the question "what is remote access software?" then you're just at the right time and at the right place. Today's article will answer the question what remote access software is and how important it is in modern education. Remote access software is a tool that is used to enable remote access in a specific computing device. Simply put, it allows users to remotely access a device from another device as if they're sitting in front of it. With the help of the internet and virtual connection, users can perform several tasks on the remote device including app management and troubleshoot overhaul. For example, you're presenting a report in front of the class and you need to access an important file on your home computer right away. If both of the devices have the same remote access software, and someone can access your PC at home, then it's still possible for you to get the file you needed for your presentation. What are the Educational Benefits of Remote Access Software? The above example is just one of the most common solutions remote access software provides. There's still a lot of things remote access can do, specifically for education. Let's now take a look at how impactful remote access software is to modern education. One of the most obvious benefits of remote access software on education is the increased interaction between the students and the teachers. With remote access software, teachers can remotely control the lesson anywhere they are in the classroom. If the teacher uses a desktop to present his or her discussion in front of the class via a projector, the teacher can just simply connect the desktop to one of his or her devices using a remote access software. This gives him or her the total freedom to roam around the class while still having control of the desktop that contains the lesson being presented. The teacher can also use remote access software to share the content of the lesson from his or her device to his or her the students' laptops or iPads. Not only does it allow them to view the lesson from their own device, but they can also take control over the lesson, or give their own comments about the discussion. This gives them the chance to increase their involvement inside the classroom. Another benefit remote access software can provide is screen sharing technology. This technology allows teachers to share their screen to the rest of the class' devices. This will enable students to view the lesson in front of the teacher's screen, allowing them to increase their interactivity inside the classroom. Students can also do the same thing for reporting purposes. Instead of using a projector, they can just simply share their screens to the rest of the class' devices so there's a significant flow of interaction between the presenter and the listeners. By using screen sharing with existing computers and devices, the school can eliminate the need for expensive interactive whiteboards or IWBs. This will help the school save big on money and avoid extra finances. It also helps students who have low vision see the discussion more clearly. Instead of looking at the projector or the whiteboard from afar, they can just simply view the lesson in front of them, providing them with a full-color picture view of the screen. With the introduction of computers, laptops, and handheld devices to educational institutions, remote access has become more relevant than any other time to education. Now that we've seen remote access being used in education, it's time for you to take the opportunity to use it for your own educational benefit. 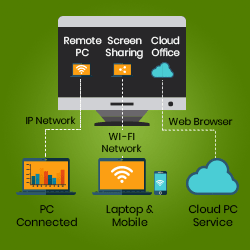 Does Remote Desktop Software Benefits is helpful?